Vencorex welcomed a delegation led by His Excellency Mr. Sihasak Phuangketkeow, Ambassador of Thailand in France. The visit was introduced by Sutin Chamulitrat, VP Sales and Marketing and Pascal Lecroq, HR and Communication Director. They explained that Vencorex is fully supported by the Thai group GC, especially on all the investments engaged during last years. This visit was informal, but integrated with an official program, dedicated to new business opportunities between France and Thailand. 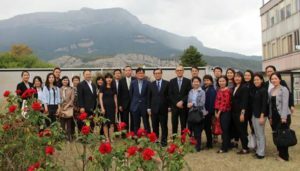 Visitors were particularly interested by the technicity of the plant, implementation possibilities and presence of high-level universities and R&D centers in the Grenoble area.